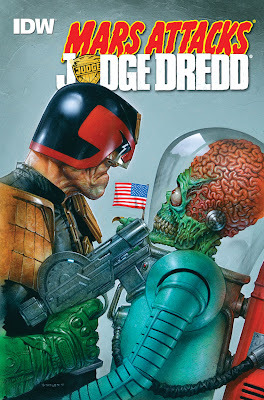 downthetubes.net news blog: Mars Attacks Judge Dredd! Step on up and place your bets! An army of angry green men bent on galactic conquest have landed in Mega-City One, but they didn’t count on the grizzled lawmaking legend of Judge Dredd standing in their way. The skeptics say it’s one man versus an army, but obviously those naysayers don’t know the Judge named… Dredd! Written by veteran Dredd writer “Action” Al Ewing, drawn by Mars Attacks’ “Joltin’” John McCrea, and sporting covers by “Gorgeous” Greg Staples, these villainous Martians are in for the fight of their lives when they take on Mega-City One’s Number One Lawman. It’s a September to remember! It’s bug eyes and disintegration rays versus a fully loaded Lawgiver and a zero-tolerance attitude in the Brawl for the Sprawl!